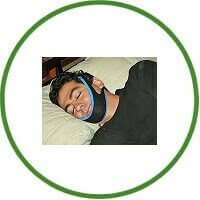 The My Snoring Solution jaw strap has been clinically proven to stop snoring! When you wear a chin strap before sleeping, it acts like a sling that serves to hold your jaw firmly in place. Thanks to this, the mouth stays closed and this forward position of the jaw reduces the risk of the tongue and throat tissues falling back to block the airways. The end result – there is no snoring. If you know someone that has sleep apnoea, please try to help them. My Snoring Solution Review – Does This Anti-Snoring Chinstrap Work?